Discussion in 'iPhone Tips, Help and Troubleshooting' started by iRock1, Aug 19, 2014. So I have three different pieces of information. What the heck? By the way, the iPhone is fully synced, and I've already tried restarting it with no luck. You're looking at wrong place. 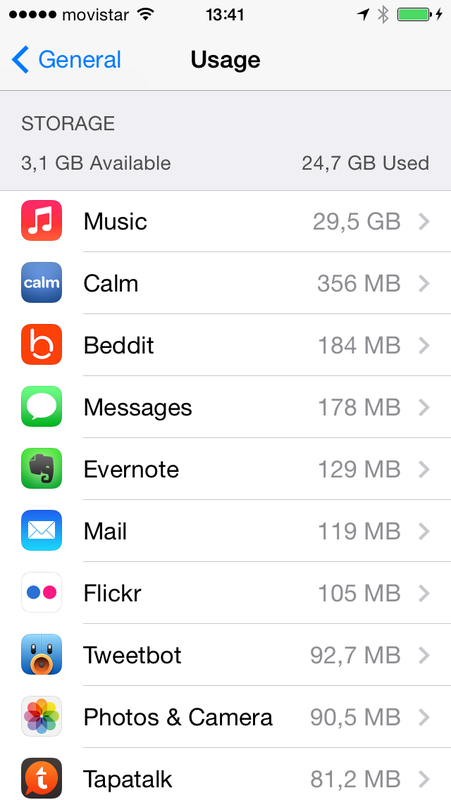 That will tell you how much space you have left on your iphone. My numbers are the same in both places, usage AND about. What version of iOS are you using. The reason I ask is that picture looks wrong. The numbers have commas not full stops for the decimal. That's just international localization since different countries and regions around the world express some things like decimals, dates, etc. in somewhat different formats. Its some sort of database error/corruption with your music app. I would wipe your Music.app data, verify it returns to zero, then start fresh. Ok, I'll try that and see if it fixes the problem. Ok, I did that and now everything seems to be kind of normal. Still I see some discrepancies, though minimal. For instance, my iPhone says that I have 21.3 GB in music, while iTunes says it's 21.12 GB. Also, my iPhone says it has 1.5 GB available, while iTunes says it's 1.84 GB. And on top of that, yesterday I took three photos with my iPhone. After connecting it to iTunes, the latter said that there were 3 photos and they were taking up to 180 MB of space, which is impossible. Certainly now the situation is not as absurd as it was exposed in the first post, but still I see plenty of errors when it comes to actually displaying the used and free space, both in iOS and iTunes. This could be rounding errors somewhere. I wouldn't sweat. my iPhone says it has 1.5 GB available, while iTunes says it's 1.84 GB. Certainly a little more significant, odd. No suggestions. How much of that space could be attributed to Photostream? Settings -> General -> Usage -> wait for the spinwheel to finish and look for Photos. There is also the thumbnail index files and the small thumbnails (for both camera and synced photos of the photo app) in there, which is likely most of it. I've noticed a lot of inconsistency as well. How "off" is your available vs used (vs total capacity of your phone) on the device now? Is it possible that itunes syncs compressed versions of your music to your phone, but on itunes it shows its regular file size? I had nothing on Photostream at that time. Absolutely zero items. Now the Settings menu shows an used space of 27.3 MB in Photos & Camera, though I still have zero items. I guess it's the Camera app only (though that doesn't explain the previous error). In my previous post I specified the used and free space, according to iTunes and the iPhone. Regarding your first comment, how could three thumbnails reach such an absurd amount of MB? That wouldn't explain it. It could be. I have configured iTunes so everything that goes into my phone is converted to AAC at 192 Kbps. However, iTunes shouldn't calculate the used space based on the real size of the original files, as those are only stored in my iTunes library and they don't exist on my phone. Also, that would explain the music part only, not the errors on the free space calculation and the ones related to photos.